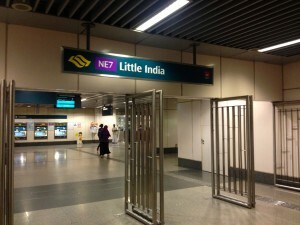 Time for a Singapore Wrap-Up! 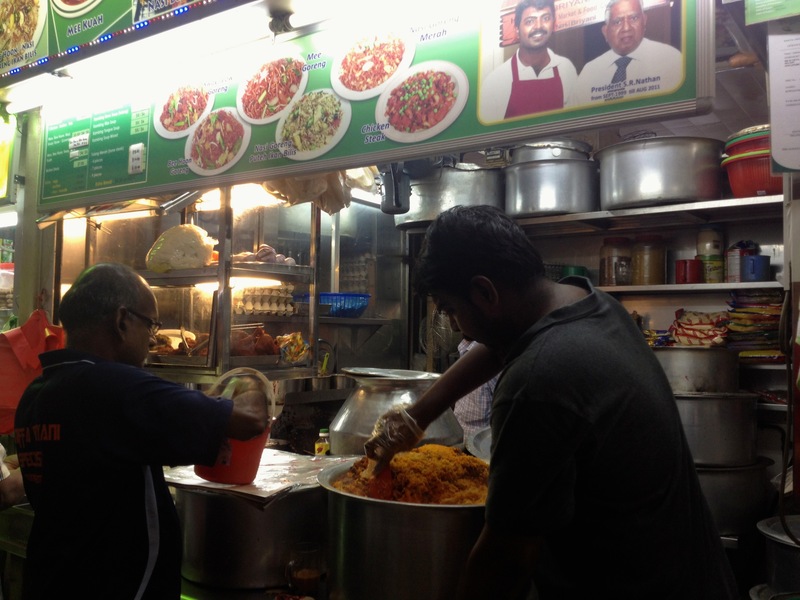 I already wrote about my love of Little India, about all the great things we ate in Singapore, and about what you can do there for free. 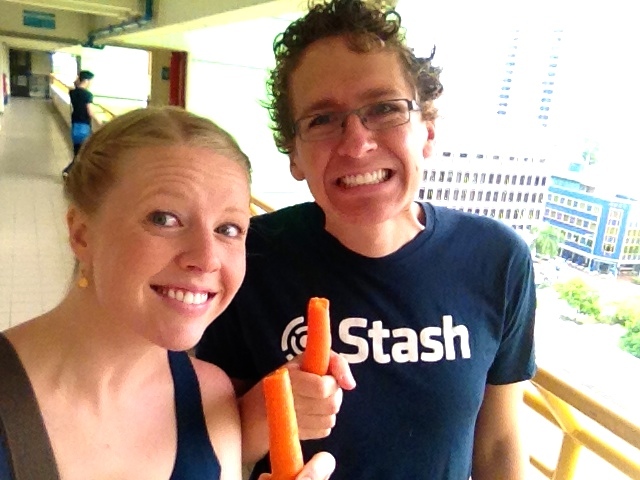 Here’s a quick wrap-up of our thoughts on Singapore based on our 1-week trip there! Is Singapore worth the trip? How long should you stay in Singapore? We were in Singapore for 7 nights. Two full days were dedicated to the conference, so we had four and a half days to explore the city. We thought that was too much! If you’re not going to go to Sentosa Island to visit Universal Studios, three full days of exploring is plenty! If you plan to hit Universal Studios (which we skipped because of the high price tag and because it’s so similar to what we have in the States), add an extra day. How much walking did we do in Singapore? Wear comfy shoes and get ready for lots of walking! In total, we walked 154,577 steps, or 67 miles. On average, we walked 22,082 steps, or 9.5 miles, per day. On our biggest walking day, we walked 32,797 steps, or 14.1 miles, which is over a half marathon! Bring comfy shoes, and come ready to walk! It’s the best way to see this city. There is always toilet paper, and you can flush it. WIN WIN. 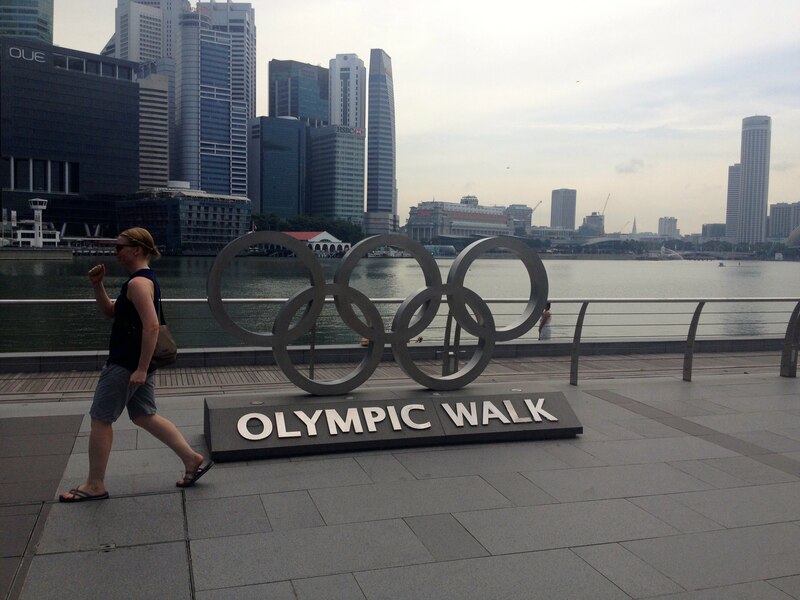 Singapore is SO walkable, with its huge, wide sidewalks, gorgeous river promenades, and awesome pedestrian bridges. Singapore has the best public transit I’ve experienced in my life. It is spotless and DOES NOT SMELL. Far cry from some of the public transit systems we have in the States. Green spaces are everywhere! Singaporeans are very proud of the green spaces all over the city – it definitely helps dull the feeling that you’re in a concrete jungle, and makes walking around much more pleasant! Singapore is almost spotless – there was no dog poop to be had on any of the sidewalks. Tap water is drinkable in Singapore! You’ll be hard pressed to find water fountains here (we only spotted 2 during our entire week here) but it’s perfectly fine to just fill your water bottle up in a bathroom faucet. We did this all week and we’re not dead. Air conditioning is king in Singapore! Sure, it’s nearly on the equator and feels like an inferno outside much of the time, but that’s not a problem when the malls and shops are all cooled to arctic extremes! The prices of coffee and booze. Way to spoil our fun, sin taxes! We saw beers that cost as much as S$20! Starbucks’ menu was unreal – to name a few prices, Hot Chocolate starts at S$6.50, Tea Lattes at S$6, Drip Coffee at S$4, and Mochas at S$6.80! The internet at cafes and the library was actually SLOWER than what we’ve run into in Chiang Mai! Not what we expected from such a modern city. 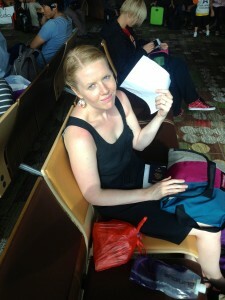 We obviously don’t travel with drugs on us, but that is especially important in Singapore. If you’re caught smuggling drugs into the country, you will be “hung by the neck until dead” on the next Friday. Fun times. How much does a week in Singapore cost? Booze S$17 $13 The cost of just 2 beers in Singapore, during low hours when one beer is on discount! Red Dot Ruby Conference Tickets S$550 $360 Tickets for 2 people – note: conferences in the US can cost thousands of dollars. This was a bargain as far as conferences go! Where’s the most expensive place you’ve ever traveled? 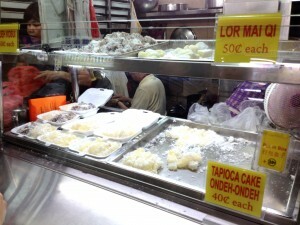 Singapore on the Cheap: What you can do in Singapore for free! Step 1: Skip the traditional hotel! Hotel room prices in Singapore are insane, so seek out your lodging search using Airbnb or Roomorama. 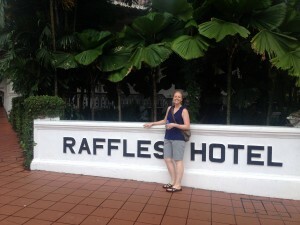 For solo travelers, hostels in Chinatown or Little India might be the cheapest option. We booked the cheapest room we could find on Airbnb, and one week still cost us more than a month’s rent here in Chiang Mai. It was a little rough around the edges, with a decor style I would describe as “prison eclectic”, but we had a hot shower every day and a bed to sleep on at night. Success. 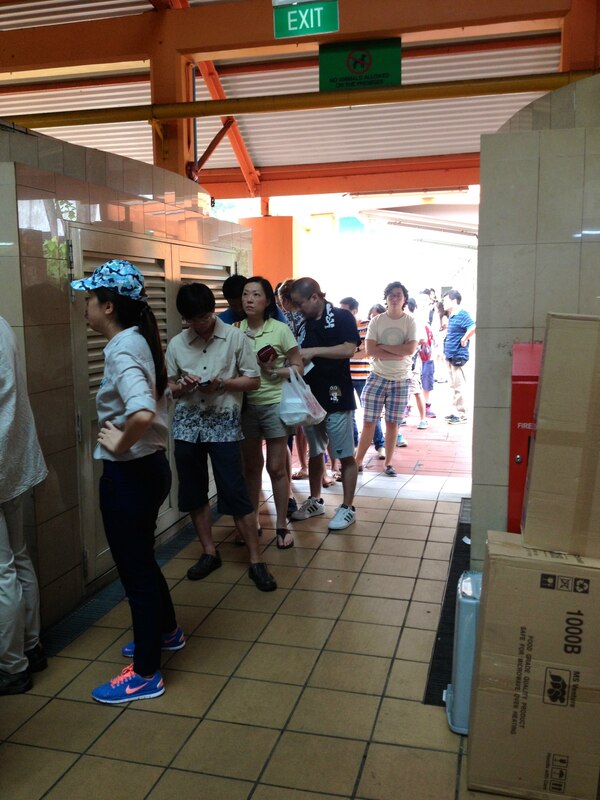 Step 2: Take advantage of Singapore freebies! This is our #1 freebie pick in Singapore! The Gardens by the Bay grounds are enormous, and full of beautiful botanical wonders. 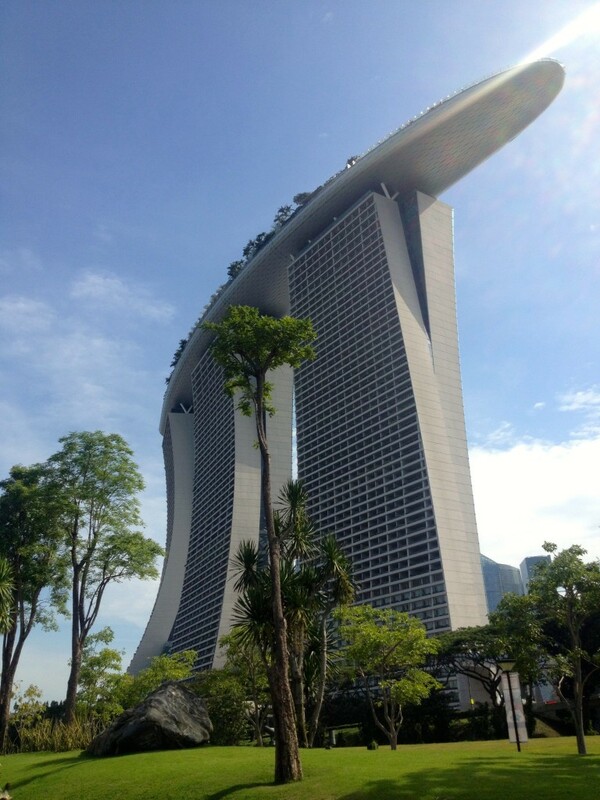 Nearly the entire complex is free, it only costs money to go into the indoor portions or up in the OCBC Skyway. We skipped the paid parts and it saved us over S$25 per person! Walk all the way out as far east as you can, and enjoy sitting on the green roof of the Barrage Visitor Center where families are picnicking and flying kites. We also saw a couple taking wedding photos! Every night at 8pm and 9:30pm (and on Fridays and Saturdays at 11pm), the fountains in front of the Shoppes at Marina Bay Sands light up and dance to a fun 15-minute musical program. Crowds start gathering as much as a half hour beforehand to stake out spots on the tiered wooden deck seating, so grab some snacks and arrive early! 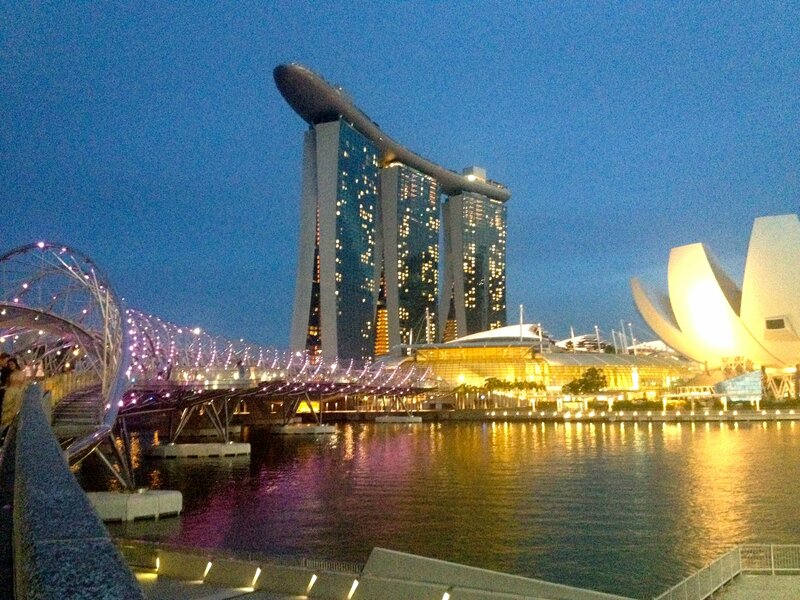 For visitors to Singapore, it’s free to enter the Marina Bay Sands Casino! 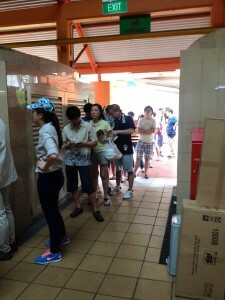 (It costs S$100 for Singaporeans to enter, and Cubans and North Koreans aren’t allowed entry. From what we can tell, you may even be barred entry even if you’ve got a Cuban stamp in your passport!) 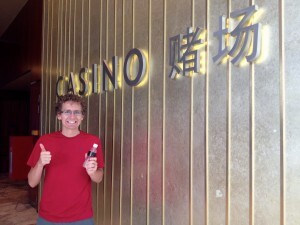 Once you’re inside, the gambling sure isn’t free, but soft drinks, coffee, tea, hot milo (like hot cocoa), and bottled water are free! To my dismay, they didn’t have games like “Pick a Number” and “Which Hand” like I was led to believe were part of Casino gaming by Uncle Eddie in National Lampoon’s Vegas Vacation. Sigh, life will go on. Admission Tips: A sign outside the casino claims that flip flops aren’t compliant with their dress code, but they let us in without question. You must show your passport for admittance. The entrance to the casino is inside the Shoppes at Marina Bay Sands Mall. 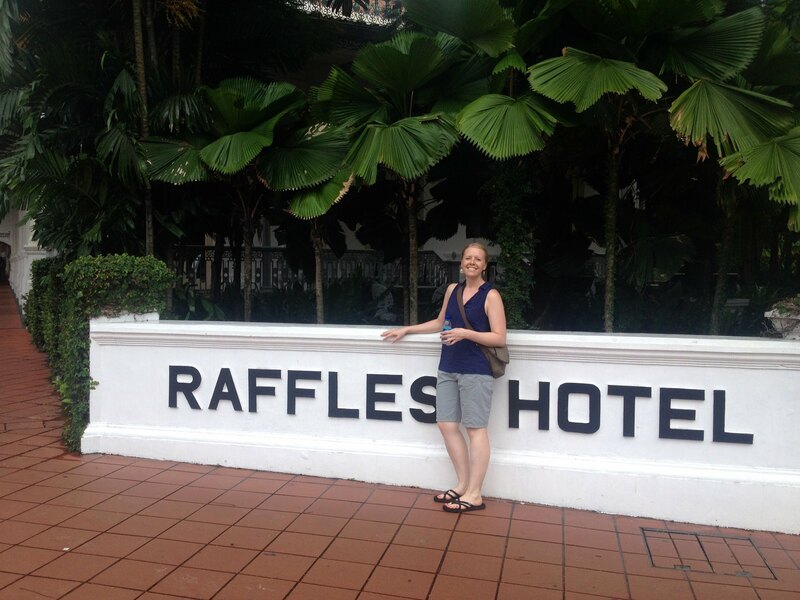 Raffles Hotel, home of the S$27 Singapore Sling! Ouch! The Singapore Sling is a disgusting drink, in my opinion – I would rather drink cough syrup. 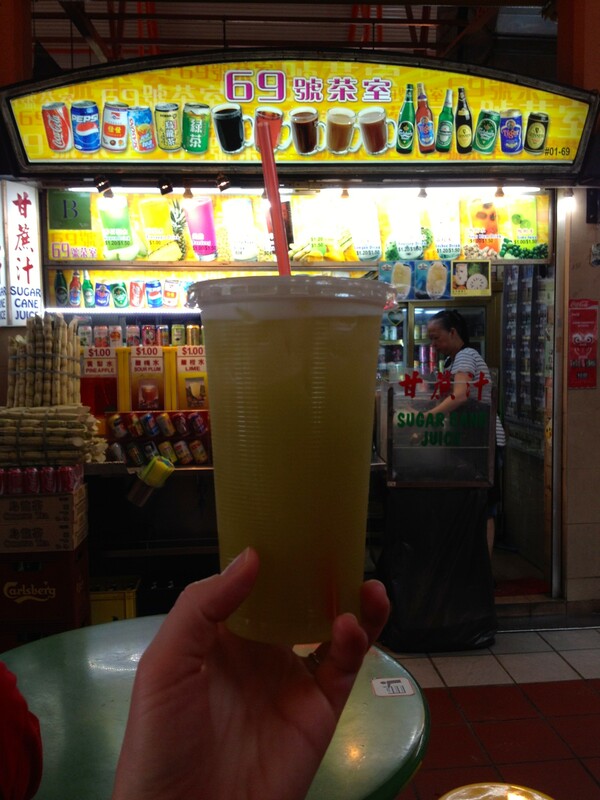 A Sling at the iconic Raffles Hotel, where this sickly sweet drink was invented, will cost you an outrageous S$27. Word on the interwebs is that they don’t even make each sling fresh at Raffles, instead opting to use a pre-mix! We decided not to buy a Sling in Singapore, but were delighted when we got to Changi airport and found out that the duty free liquor shoppes had free samples, made from top shelf liquors! They even let me mix it myself! 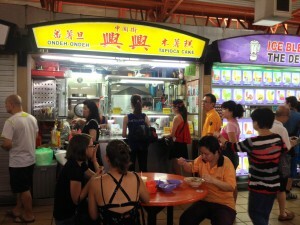 Step 3: Eat at Hawker Centers! 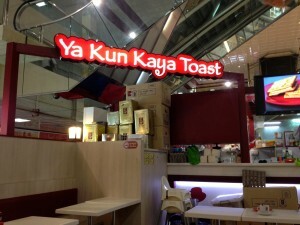 A wise group of Singaporeans once told us that you should never eat in a sit-down restaurant here. 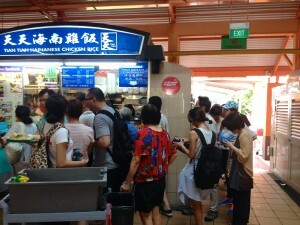 In the Hawker centres, the food is better AND cheaper! Win Win!! 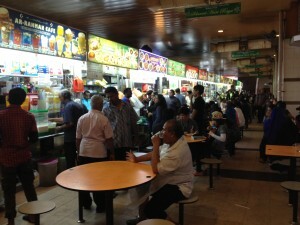 For more info on Hawker Centres, see my previous posts on Little India and on Eating in Singapore. Step 4: Get yourself some of that free wifi! Important tip: Don’t forget to use a VPN like Cloak to protect your personal information if you’re doing anything sensitive while using a Public wifi network! Bring your walking shoes! Prepare for a walk of Olympic proportions (see photo below – har har har). One day, we actually walked over a half marathon (over 14 miles in one day, as reported by my Fitbit pedometer)! Awesome Views from The Helix Bridge! Take the time to visit all of Singapore’s fun neighborhoods – we could (and did) spend days exploring Little India, Chinatown, and Arab Street. We also enjoyed walking through Fort Canning Park, just north of Chinatown. While it’s probably not worth the trip if you’re not already in the neighborhood, we enjoyed walking around there. We especially enjoyed the spice garden! I’ve never seen a vanilla tree before, or a nutmeg tree, or so many herb plants. There’s nothing we love on a vacation more than walking around exploring new cities. Which cities do you recommend most for exploring on foot? For us, nothing beats exploring the awesome little towns in the Rhine River Valley area of Germany – the best! 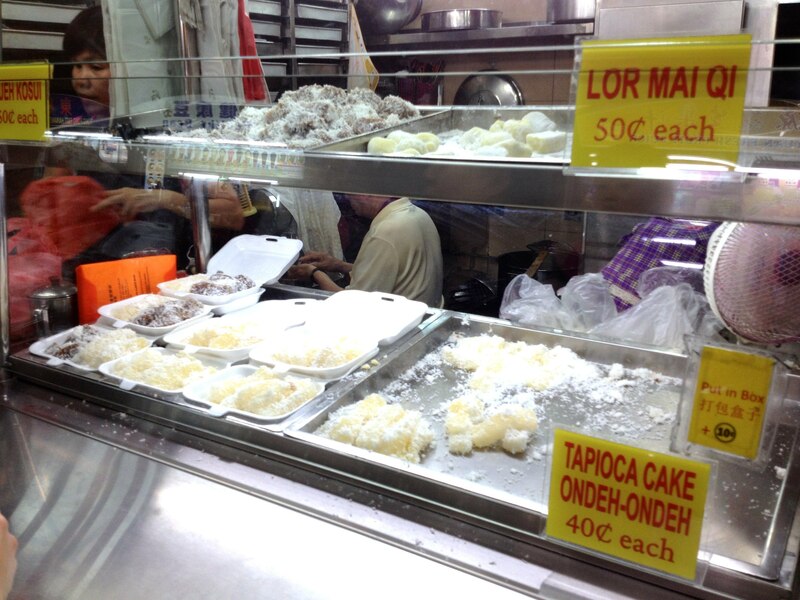 Singapore’s food scene is absolutely epic. 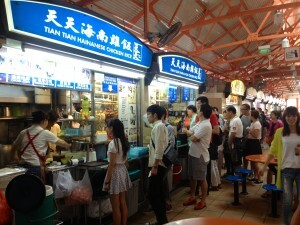 There are food centers full of “Hawker Stalls” all over the city where you can try dishes from all over Asia. 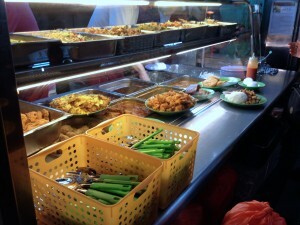 Not only is the food at Hawker Stalls more delicious, it’s also much cheaper than sit-down restaurants. Contrary to what you might think after reading my last post, we ate more than just Indian food while we were in Singapore. Here’s a summary at some of the tasty things we tried. Curry Rice, Cabbage, Chicken and a Fried Egg for S$3. This is THE Hawker Stall to get Singapore’s famous Chicken Rice dish! Can you believe this line? Unbelievable line! The wait was about 20 minutes! 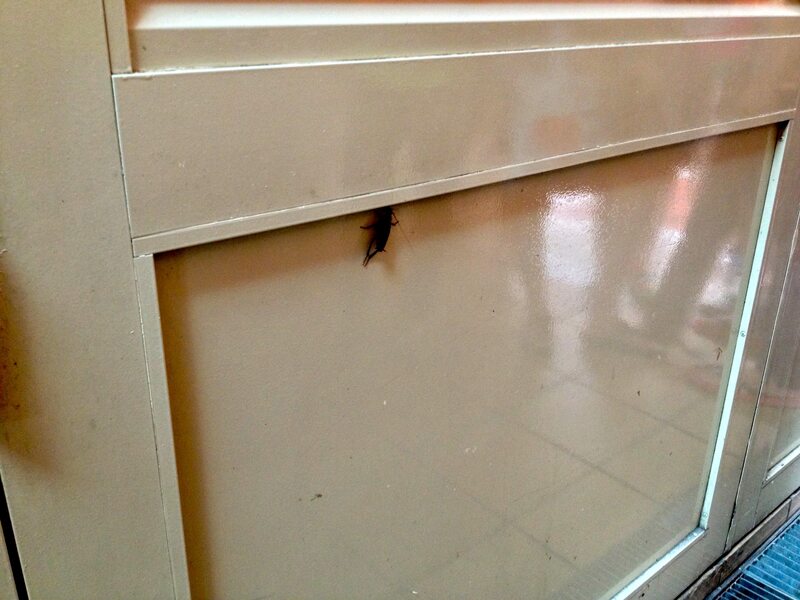 The flying cockroach that climbed Kevin’s leg. We ventured up to the Arab Street neighborhood, a great spot to just wander around and look at all the fun fabric shops and the beautiful Sultan Mosque (photos of this to come in a later post). 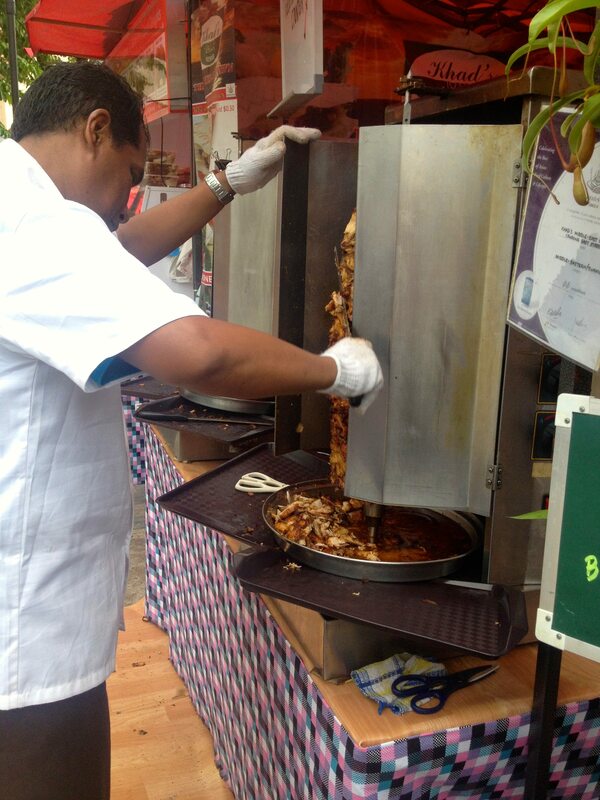 There were a bunch of street food tents set up for Ramadan, so we snagged ourselves some dinner. 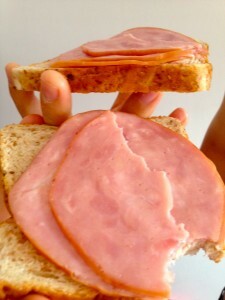 But sadly, for S$5, this is all we got! Is this the saddest pita you’ve ever seen or what? Luckily, our next purchase redeemed Arab Street for us. 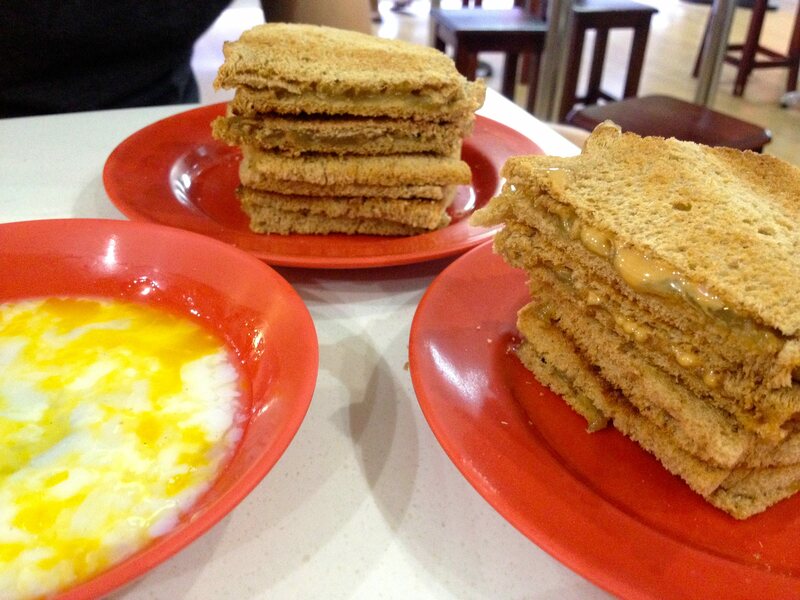 We decided to try the “Roti Jack” with chicken, egg, mayo, cheese, mushrooms, and spices. 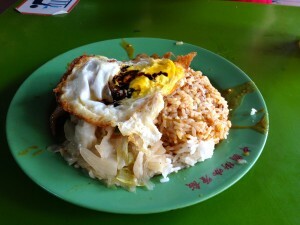 It was greasy, salty, wonderful, delicious goodness and was super filling for just S$5. The folks at this food stall were super friendly too – after finding out we were from the USA, the Roti Jack Chef sang the Star Spangled banner to us. It was awesome. We didn’t hit many coffee shops in Singapore, where a Latte can cost as much as S$13! But here’s a peek at a few of our indulgences. 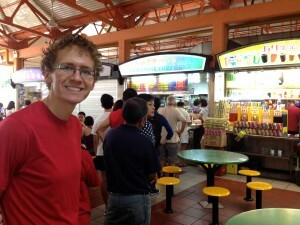 We stopped at a Chinese Bakery for a S$1 Milo Bun, which was delicious. Milo is sort of like Rich, Chocolatey Ovaltine. We visited Starbucks twice. The first time, we shelled out S$9.20 for two French Press Coffees (yikes!) but got a Buy One Get One Free coupon we used on our second visit! Cheap traveling WIN. Kevin has been PINING for an IPA since we left Seattle. So when we walked past Brewerkz in Singapore, we pretty much had no choice but to go inside and do some drinking! 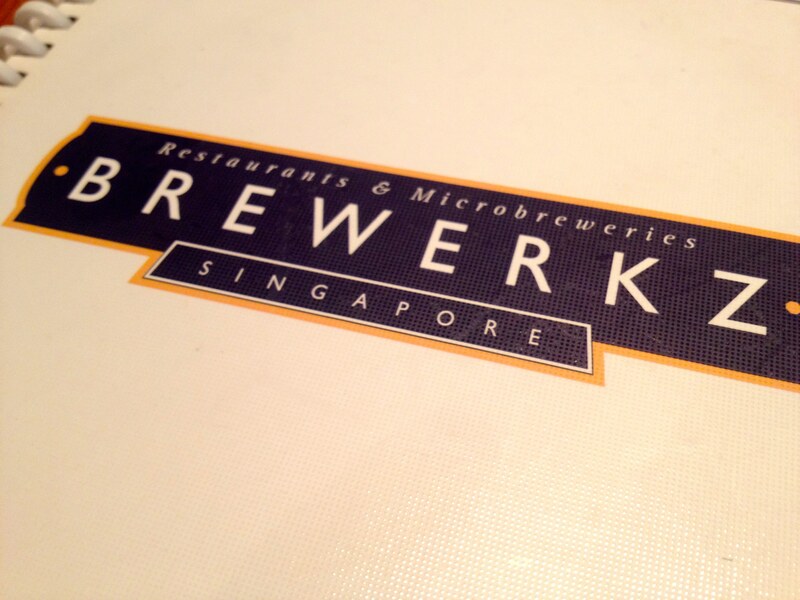 Brewerkz has a complicated pricing scheme – beers are S$6 cheaper between noon and 3pm than they are after 7pm! Is that crazy or what?! So you can bet your bottom dollar that we did some day drinking. We had the IPA and the Black Pig (sort of a black IPA). 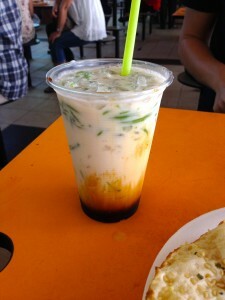 With the 10% service charge and VAT (tax), this ran us S$16.50, ouch! But we did get free wifi and did some work in their bar area. 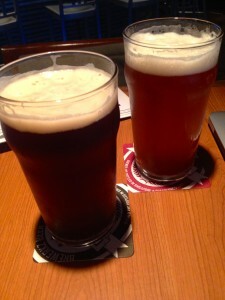 Tip: Ask about the beer of the week – it’s S$2 off! The verdict? Even Durian in the form of Ice Cream is not for us. Also, a word of caution, even the Durian Ice Cream will give you Durian burps – there’s nothing quite like having garbage burps for a couple hours! Jumbo Seafood took a jumbo bite out of our travel budget (har har har…). 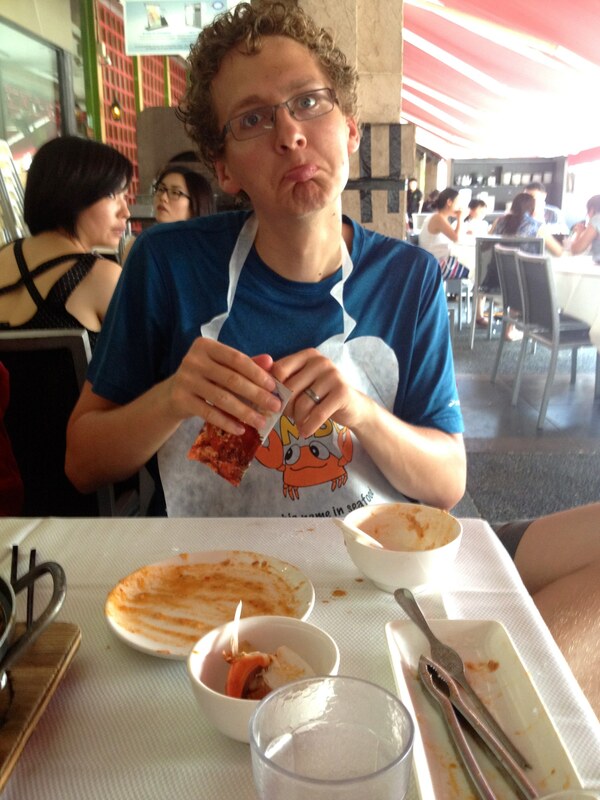 For a Chili Crab, a plate of asparagus, rice and steamed buns, we paid S$90! But it was delicious. Check out the mess we made. Why on earth they use white tablecloths is beyond me! 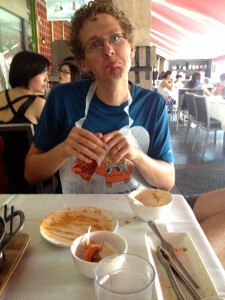 Sad the Chili Crab is gone! We did a number on the tablecloth. It came with coffee and soft boiled eggs, which made me feel like I was eating snot. Fun times. 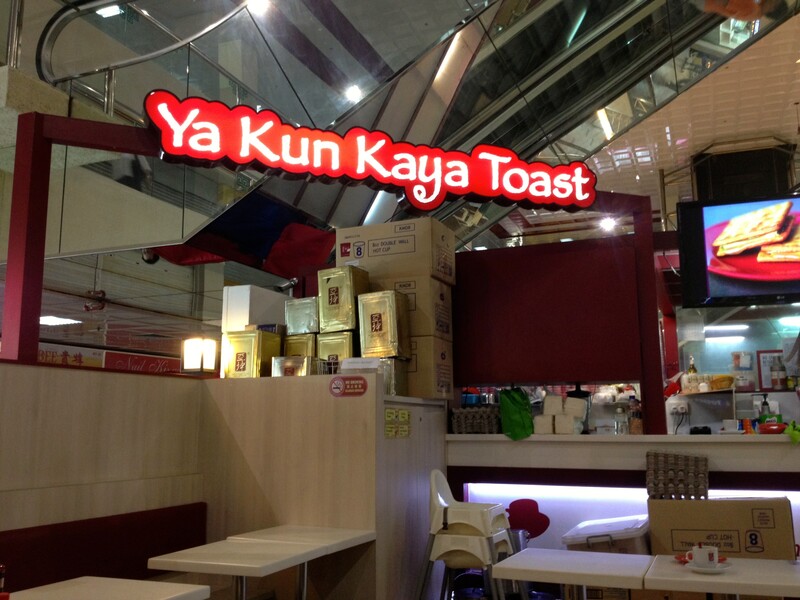 This Kaya Toast Cafe is called “Heavenly Wang”. I couldn’t make that up. What’s the best meal you’ve had on your travels? Do you have a particular country where you enjoy food the most? For us, it’s a close race between Vietnam and Thailand. I love Indian food SO MUCH. I love it more than cake, more than sweet corn, more than ice cream, even more than home baked wheat bread. So when we stumbled upon a neighborhood called Little India during our recent 1-week trip to Singapore, I became a little attached to it. We went out to eat for 11 meals during our recent weeklong trip to Singapore, and a whopping 6 of those meals (SIX! OVER HALF!) were in a little slice of Heaven called the Tekka Centre in Little India. It was like angels were dancing on my taste buds, for realsies, and I loved every minute of it. In order to control the street food scene that is so much a part of Southeast Asia, Singapore has organized its food vendors into food centers more commonly known as “Hawker Stalls”. 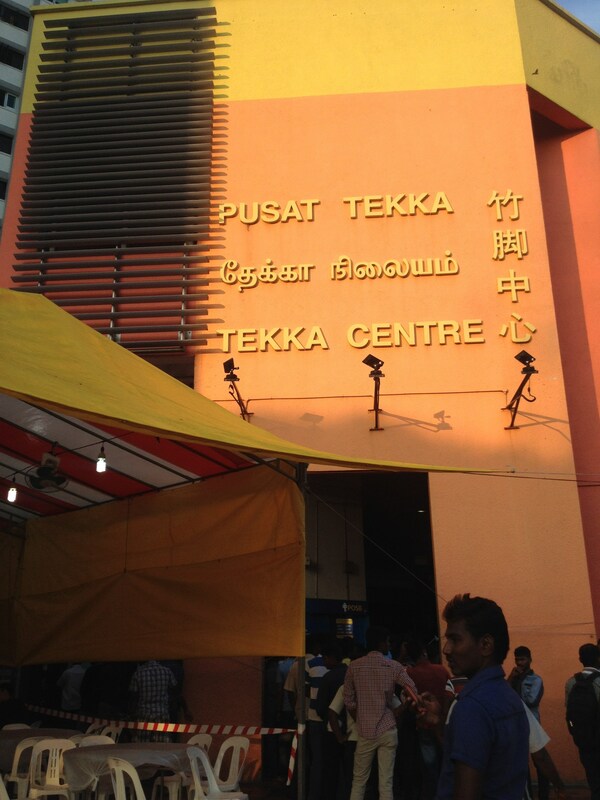 In my opinion, the Tekka Centre is the best – about half of it is Indian food, and the half of the stalls are more of the Chinese food persuasion. 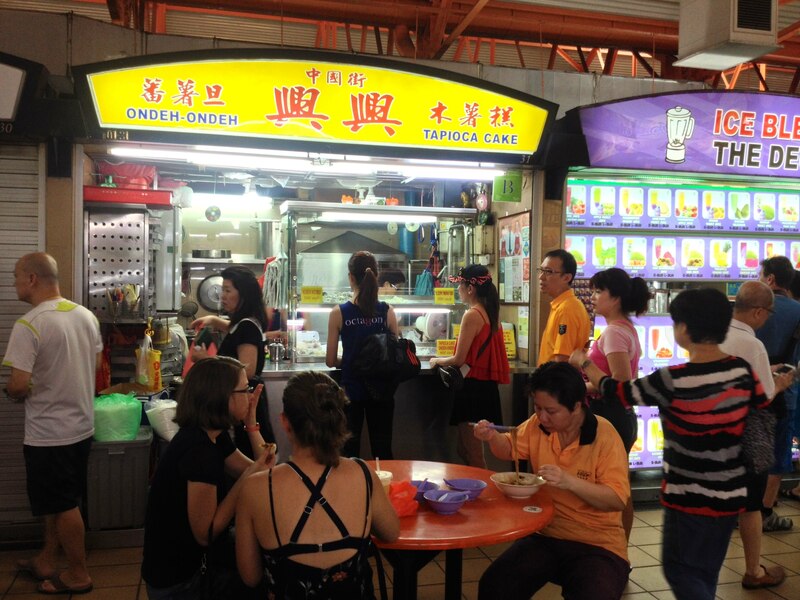 There is ONE RULE you need to follow when you dine at any of Singapore’s Hawker Stalls – go where the locals go. Never try an abandoned food stall – pick the longer lines and order what the locals order! To get to the Tekka Centre, just hop on Singapore’s phenomenal subway system called the MRT and get off at the Little India stop. Follow signs to the Tekka Centre from there, or a friendly local will point you in the right direction if you get lost. Tip: use the bathroom at the subway station! 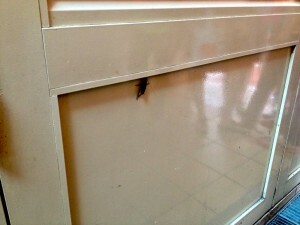 It costs money to use the one in the Tekka Centre! We tried something we’ve never seen before, a drink called “Special Chendol.” It’s a milky style drink, with lots of green jelly called “Chendol” in it. We didn’t really care for it – I felt like I was slurping up worms, but it was fun to try. We sucked down as much Masala Tea as possible at the Tekka Centre. We had at least one at every meal. 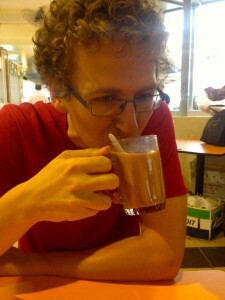 I also really enjoyed the Teh Tarik, which is similar to Masala Tea but with a more chocolatey twist – I think they put Milo in it. Also, it was just S$0.80 for Teh Tarik – bargain city! 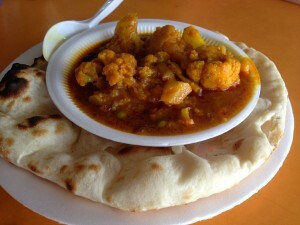 We have a naan guy in Singapore now. That’s right, we cozied up with the guys at Pak Kashmiri Delights, the hawker stall that specializes in Naan and Curries, and I learned that the stall owner lived in Connecticut for 12 years! He doesn’t look very happy in the photo below, but he was actually very friendly in person. 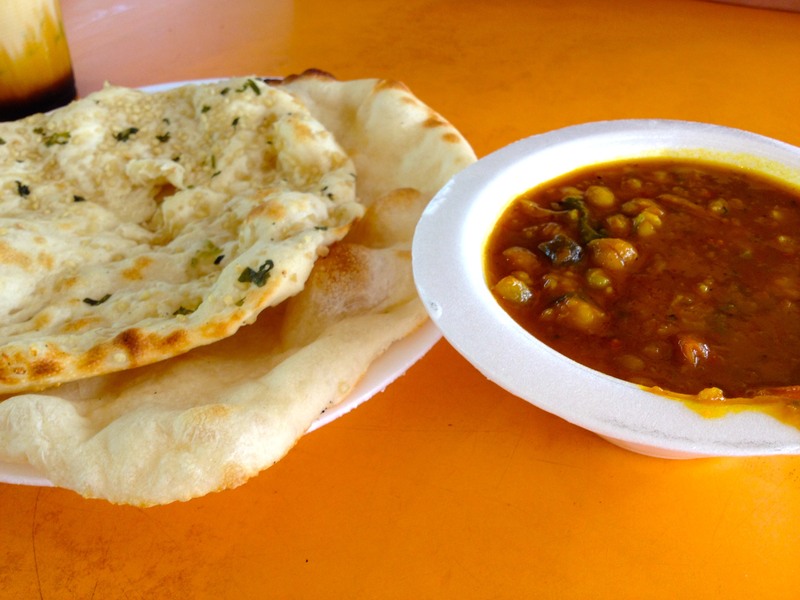 We ate a lot of Naan in Little India. I really enjoyed how they made the naan – they have a wood-fired naan oven. They press out the dough, lay it on their thick round potholder, and press it on the inside oven wall. Once it’s cooked, they use metal prongs to pry it off and pull it out. 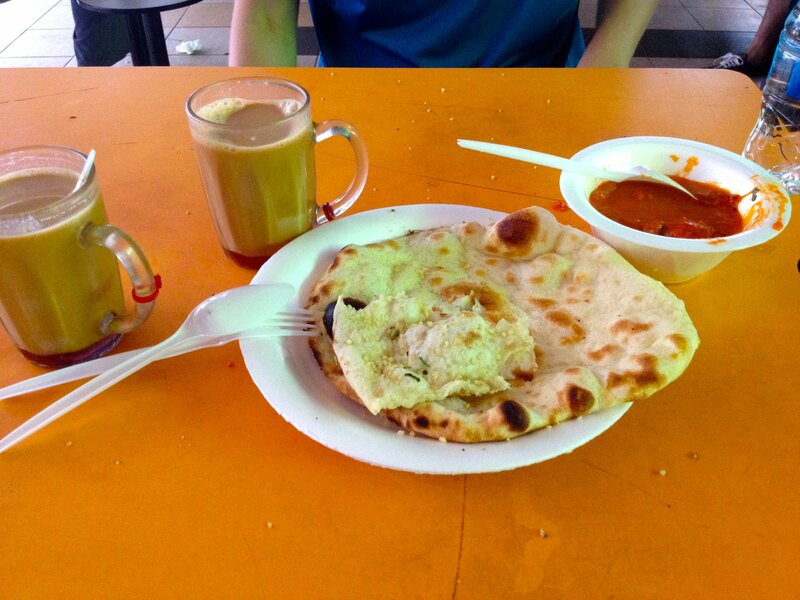 Left to right: Teh Tarik, Masala Tea, Garlic and Plain Naan, and Butter Chicken. Total S$6.80. Aloo Ghobi and Plain Naan for S$4. We discovered a dish called Nasi Biryani at Tekka Centre and loved it so much we got it three times. According to the internets, it looks like this dish is heavily influenced by Malaysian food culture, but the spices and flavorings still made it taste like it should fall in the Indian Food category. 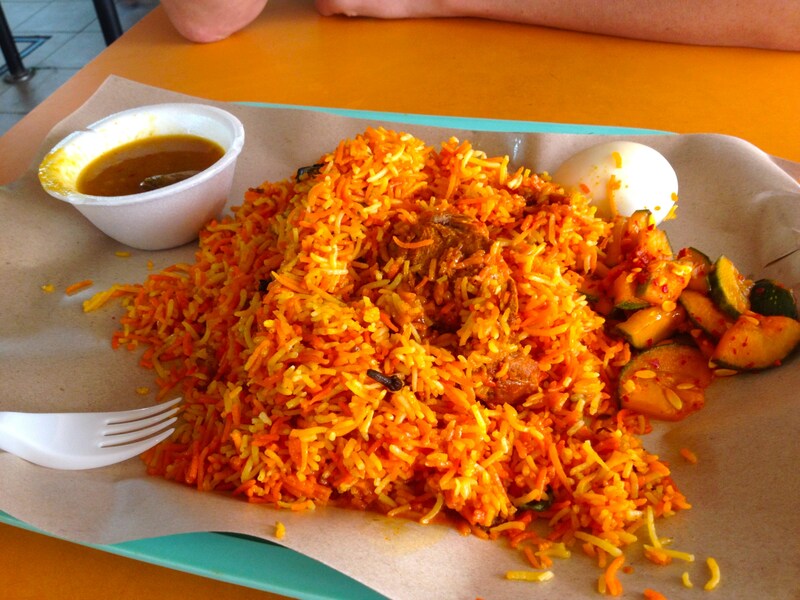 These are our Nasi Biryani guys – theirs is the BEST. 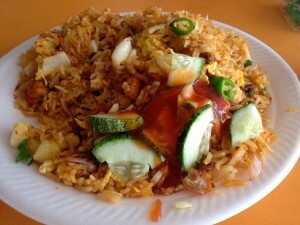 Chicken Nasi Biryani. All this food for S$5! 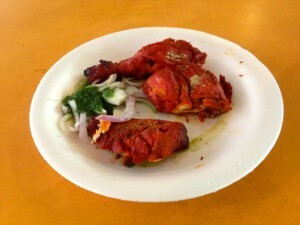 On the last day, we tried it with Mutton. Mutton Nasi Biryani was the best dish we had during our whole trip to Singapore! 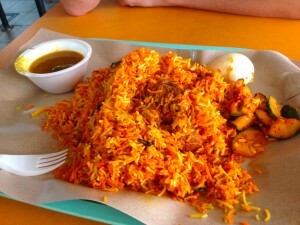 Mutton Nasi Biryani, also S$5. 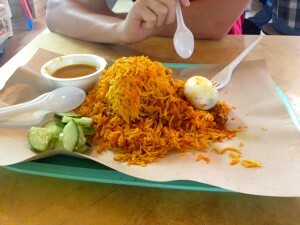 If you’re in Singapore, do not miss this dish! 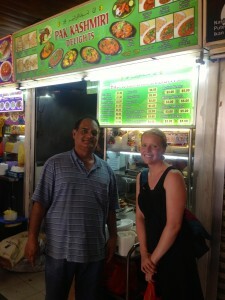 We enjoyed a couple other dishes that seem like an Indian twist on Malaysian food. First, we tried Nasi Goreng, which was sort of a Fried Rice dish with spices commonly found in Indian food. We both really enjoyed this dish – pretty light and delicious. 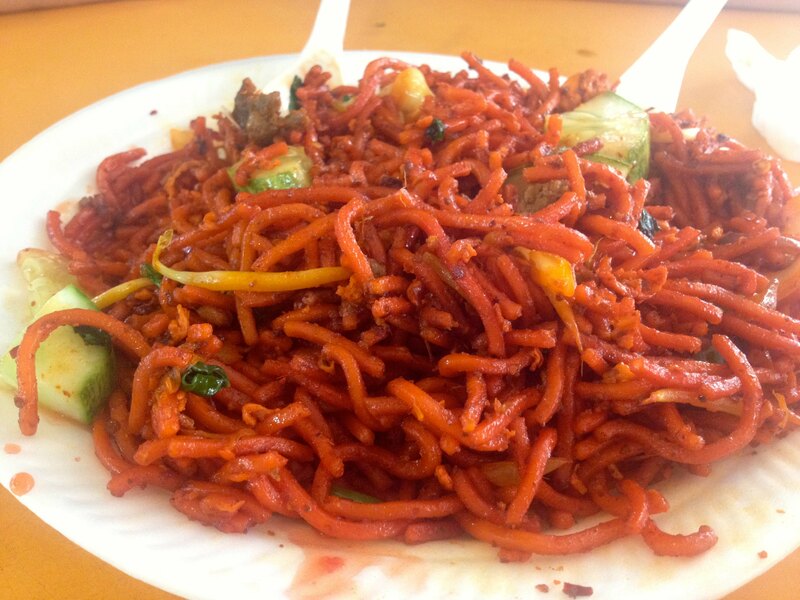 The other “Goreng” dish we tried was Mee Goreng, which looked a lot to me like cut up spaghetti noodles. I was skeptical, but all the locals seemed to be ordering this dish so we gave it a try. 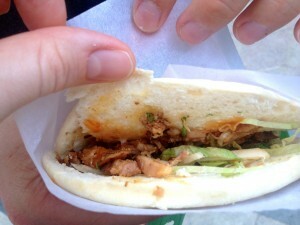 It was really tasty, but we liked Nasi Goreng better! Where have you tasted your favorite Indian food? Have you been to India? Should we put it on our travel wish list?